This mantra is done mentally with the breath. One cycle of Sa-Ta-Na-Ma takes about 30 seconds. Continue in this cycle for 3 minutes. Now inhale, exhale and relax. Enjoy the conscious state. Practice this meditation up to 31 minutes, but build up gradually from 3 minutes by adding one minute per day. This is a powerful meditation in the ancient technology of pranayam. It has not been taught openly before and should be practiced very properly. When you begin the breath, take a deep exhale and then start inhaling. 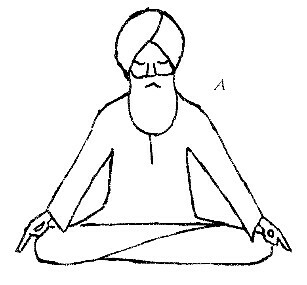 If someone does the meditation without preparing the nerves slowly, then after 31 minutes he may just faint. Someone should normally stand by you for this meditation in case you overdo it. He must give you water immediately if a faint comes on. Try creating a sound to be listened to by your inner most Self. There lies your power, be guided by your Self. This pranayam makes it possible to communicate with your deepest Self. This kriya is the “simran pranayam" in which you have the authority to expand your consciousness and your ability and your brain cells. This meditation activates the central nerve channel of the brain, the pituitary, pineal, and fontenal areas. It is also excellent to reduce body weight when accompanied by an appropriate greens diet, (see: foods for health and healing by Yogi Bhajan).